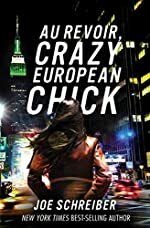 Review: You'll find action explosions and more when you read Au Revoir Crazy European Chick by Joe Schreiber. It is a fast paced book that will have you hooked from page one all the way to the end. With twists and unexpected turns, Au Revoir Crazy European Chick is exciting and adventurous. Au Revoir Crazy European Chick begins when foreign exchange student Gobija Zaksauskas asks Perry Stormaries to the prom. Perry doesn't know what he's in for. At the prom he's nearly mugged but amazingly, Gobi hurts the mugger and sends him to the Emergency Room. Subsequently, Perry finds out Gobi is actually an assassin and has five targets she must kill. As a result, this takes them to New York City. Even though Perry doesn't want to go, he follows Gobi. Perry's band is expecting him in New York but Gobi threatens to kill him if he doesn't help her find her targets. Will Perry help Gobi? What will happen to Perry? Find out these answers when you read Au Revoir Crazy European Chick. Au Revoir Crazy European Chick gets five out of five stars. It has action on every page. This is a great book for people ten and older. You can sometimes relate to the characters and other times you can't because of all the action. Nevertheless, you won't want to miss a page. Because of all the action, you won't put this book down. Schreiber keeps readers on the edge of their seats because of his writing! "The glass shattered when the bomb hit the window" just makes readers get excited! It is great for any occasion, and it can be enjoyed anywhere. If you like action and adventure combined with some awesome espionage, you will want this on your bookshelf TODAY! This is by best-selling author, Joe Schriber, and Au Revoir Crazy European Chick will definitely not disappoint Schriber fans, and it is certain to gain even more fans. We would like to thank Houghton Mifflin Harcourt for providing a copy of Au Revoir, Crazy European Chick for this review. Have you read Au Revoir, Crazy European Chick? How would you rate it?